Welcome to the most innovative adult advertisements portal in Prague. MySexyPrague is the most advanced and easy to use adult directory in the Czech Republic. Creating and managing your profile is easier and more beautiful than ever. Packed with features that help you stand out. Made in the Czech Republic with by a team with more than 10 years of experience in creating #1 brands across the world. MySexyPrague has the most advanced features for adult advertising. The best part – its free. MySexyPrague ranks in Google top 5 and has more than 100 000 unique visitors a month. One account and up to 5 advertisements. Managing your advertisements has never been easier. Its that easy! Our website is totally free for 4 months. Just post a profile and start meeting new people. A profile where you are the star ! Add a status update. Create a profile where you are the center of attention. Add multiple pictures, a "shoutout" message to your customers and edit it 24/7. It takes just 2 minutes - faster than you can get your coffee. As an agency add up to 10 profiles from one account. As an independent change your text, messages and pictures easily. This is the future. After clicking "promote" your profile will have a special last seen badge. This helps you to stand out. Promote is free to use! 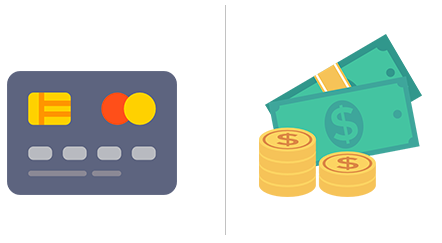 You can pay easily via local bank deposit/transfer or credit card. We use one of the worlds largest credit card payment processors CC Bill. High class profiles are shown on top of the website on the front page and have a beautiful High class badge. This means more views and clicks! MySexyPrague is an adult dating and advertisements platform with more than 100 000 unique visitors a month. Putting you in the center of attention generates more clicks and views. Making it easy gives you more time to focus on the things you love. Posting new profile is easy and fast. Our site is designed so that advertisers and customers have the best experience. Its simple as 1-2-3. The proccess takes just 2-4 minutes! What is "high class" profile? High class profiles are shown on top of the website. They also have a beautiful VIP logo. This means they get 1200% more views than a regular profile. Show that you are unique and go high class. VIP advertisement makes you stand out more and get more views on your profile. 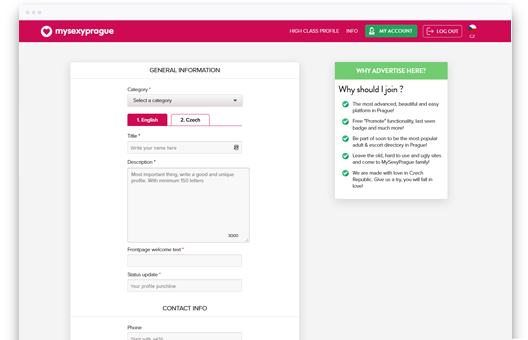 You profile will be added to the front page “VIP ADVERTISEMENTS” box and a VIP badge will be awarded. VIP profiles get almost 800% more clicks and views. What does "PROMOTE " mean? Use the "Promote" function to raise your profile to the top of the website just below VIP advertisements. You will also be the first in category view after random 10 VIP profiles. This helps you to get more views and stand out from the others.